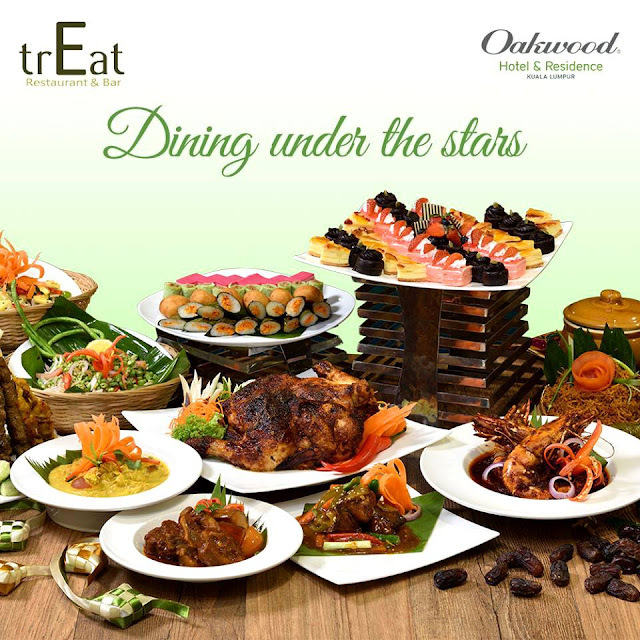 Diners are taken on a wonderful journey of Dining Under the Stars buffet at TrEat Restaurant & Bar, located at Oakwood Hotel & Residence Kuala Lumpur this holy month of fasting. Set in the bustling area of Jalan Ampang, Oakwood Hotel & Residence Kuala Lumpur offers residents a calm oasis in the heart of the business district. With 251 units available, the hotel has a swimming pool, a children’s wading pool, a fitness centre and an all-day-dining, TrEat Restaurant & Bar. TrEat Restaurant & Bar has elements of spaciousness as well as bright bold color theme. Set with a view of the hotel’s swimming pool, TrEat is cleverly designed to offer diners a cool two-level main dining area as well as al fresco area. The hotel is also pleased to introduce a new Chef de Cuisine – Chef Addy Dzulfadzl Abdullah who has whipped up Dining Under the Stars menus together with the culinary team for this special season. 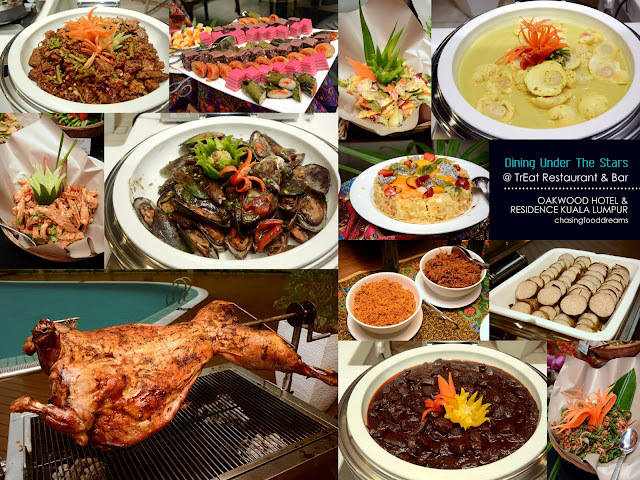 The rotated menus, featuring over 222 items, will consist of authentic Malay dishes as well as other cuisines and will also feature four ala minute stations that is set around the poolside. Diners will also be entertain by musicians every Friday and Saturday nights. Savor Roast Lamb with Percik Sauce, tender slices of flavourful lamb that is further elevated with a tasty and nutty percik sauce. There’s also a spiced rice to go with the lamb. Dine on Lemang with Chicken and Beef Serundings as well as Chicken and Beef Satay. Visit the Kerabu station for a treat of various colorful and tasty kerabus to be savor with plenty of Ulam and Sambals as well as Ikan Masin and more. Don’t forget to enjoy the Bubur Lambuk and Sup Ekor. 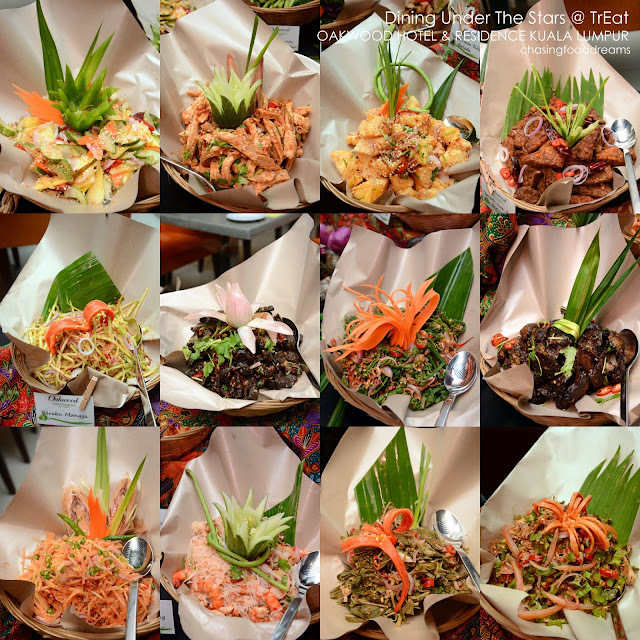 There is also a Western salad bar and some prepared salads to tempt the palate. There’s also chilled seafood of prawn, oyster and mussel. For hot dishes, the Daging Masak Hitam Johor and Telur Itik Masak Lemak is superb with steamed rice. Desserts are plenty so save room for a sweet and savory ending of Aneka Kuih Muih, cakes, puddings, cookies, mini fruit tarts, fresh fruits, Buah Kurma, Ice Kacang and more. There is also plenty of various beverages to quench your thirst. Diners also stand a chance to win a stay in other Oakwood sister properties around Asia that are located in China, Indonesia, Philippines, Singapore, Thailand and Vietnam. Please call +603 2710 9180 or email fnb.ohrkl@oakwoodasia.com for reservations.